There are 14 reviews of Aria di Capri. I see this scent is quite polarizing, you either love or loathe it. It's a comforting scent with flowers not so prominent and aldehydes not so powerful but well balanced. Mimosa adds a melancholic vibe that I find very beautiful and, paired with bergamot, which balances the other flowers preventing the composition from becoming too sweet. On the contrary: it has an interesting bitter background which I find very elegant. Yes, many find Aria di Capri a bit old school, but let's not forget that the "Old School" has created many a masterpiece that we still love and wear today. Aria di Capri is a lovely, powdery floral where no note is emerging from the others but they all melt in harmony. It's a safe scent that you can wear in your workplace or at a dinner without risking to annoy those who are around but not a skinscent. Very sunny even not a merry scent, but very beautiful too. I can't detect peach (but then I can't detect it in Mitsouko) nor do I miss it. It's a rather feminine fragrance, and yes, it has a vintage aldehydic feel. For me, it's too powdery in the beginning, but it is lovely when it settles down - and just very well done. Perfume Intelligence lists only 9 scents for the house of Carthusia, originating from 1948 onwards, yet of the 20 listed on Basenotes, all but one have release dates in the the 2000s. It would seem the original scents, all present in name, have undergone reformulation and re-release all in the past decade. Aria di Capri is certainly that rarest of creations in the perfume world, an original. It is effervescent and fizzy, bittersweet and fresh, perfectly balanced with the peach and iris notes reminding one briefly of Iris Gris, before blending with the almondy mimosa note. The lemon and orange fizz maintains its own identity against the peach/iris mixture. Stunning and unforgettable, highly recommended. I was seeking an uplifting unusual scent for spring and Aria di Capri feels right. It has just enough warmth for a spring perfume and its peachy notes wouldn't be ideal for summer, to my nose anyway. Aria di Capri has an arresting opening of lemon, licorice, and flowers. Its progress is consistent without being precisely linear, which is to say that the sparkling opening trifecta remains, but the balance between its components shifts. This motion is cyclical, so that one moment the citrus seems to dominate, while minutes later it is the anisic or floral notes that take precedence. Of the three it is the anise that bows out first, leaving a sweet/tart fruity floral accord to carry Aria di Capri forward. In time the scent’s floral heart tips decisively toward indolic orange blossom, and Aria di Capri begins to sound a soft animal purr. Woody and mossy notes are revealed as the flowers fade, and eventually these come to dominate the soft, bright, and even tender, drydown. Aria di Capri lasts very nicely for a citrusy fragrance, and it offers solid projection and moderate sillage without overwhelming passersby. 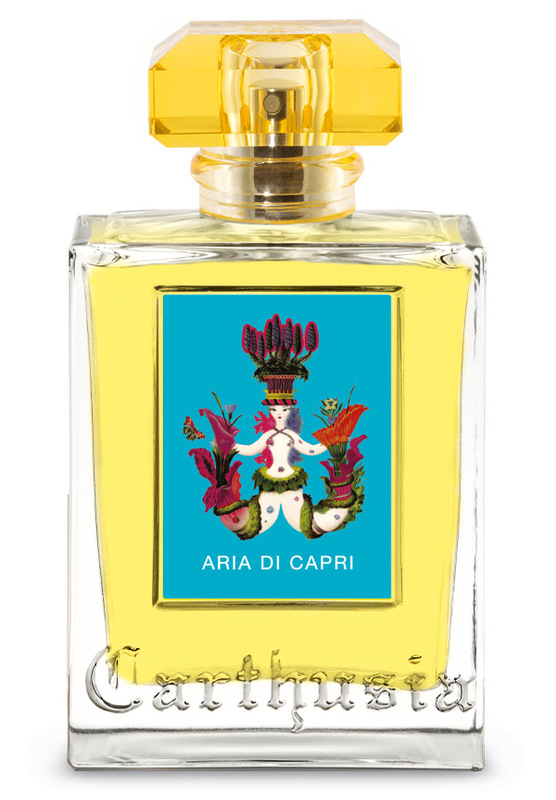 For me Aria di Capri does an outstanding job of evoking a bright Mediterranean summer, and I find it hard not to smile when I’m wearing it. I was introduced to this fragrance by a sales person stating that it was somewhat similar to Chanel's No.5. I cannot entirely agree. I initially hated aldehydic fragrances when I first started collecting perfumes, however it was due to the fact that I was trying the wrong ones. If everyone had the chance to smell Aria di Capri they may just change their mind altogether. While the scent is powdery, it's also fresh, a touch lemony, feminine and delicate. There's a beautiful honeyed mimosa note followed by a subtle, yet slightly fruity peach note. Aria di Capri would make a lovely Summer scent, however it's more for a scenic trip through the countryside in a white sundress on your way to a picnic, rather than a lazy day on the beach. Despite the fact that the house of Carthusia is rather Mediterranean in its approach, I find this fragrance the least exotic. It reminds me of an English countryside for some reason, not the island of Capri. The florals are so perfectly balanced in this fragrance, being quite sunny and energetic. Despite its powderiness, thankfully this fragrance doesn't have that all too familiar soapy accord. It's fresh but not clean. Aria di Capri is supposed to be unisex, however I feel that it leans towards a more feminine side. While this was my favourite out of the Carthusia line when I first tested it, I'm not so keen on it now that I find it a little linear. The lasting power is great however and so is the sillage, which keeps me interested. There are no member images of Aria di Capri yet. Why not be the first?